Swirly Dogs From Your Bread Machine are a baked corn dog made with a homemade yeasty cornbread dough. Mix in a bread machine, shape by hand and bake in a conventional oven. Don’t worry if you don’t have a bread machine. You can make these by hand or with your stand mixer. See directions here. Just in case you haven’t finalized your Super Bowl party menu, here’s an idea for your consideration. These aren’t the famed corny dogs of the Texas State Fair. Nonetheless, they are a great substitute for those of us who would rather not eat the fried version more than once a year. I try to buy hot dogs lower than 100 calories a piece which brings these in just under 200 calories per swirly dog. Makes a great lunch with my vacuum-packed lettuce. 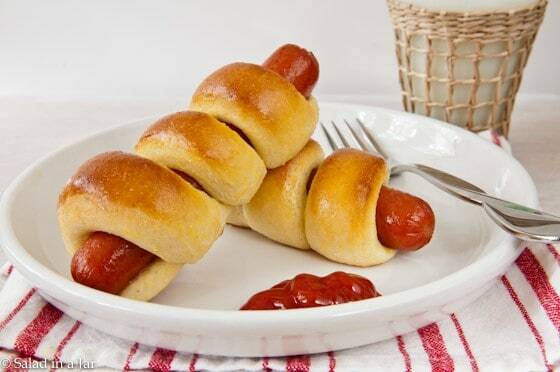 Kids love these “dip dogs” as one of my Facebook readers called them. Although she was referring to the traditional fried corn dogs, I just love the name. Swirly Dogs are easier to eat and dip in mustard or catsup than a hot dog and a bun with condiments dripping out of them. They freeze well and don’t take long to thaw and heat for a quick meal or snack. I keep baked swirly dogs in my freezer for a quick treat. 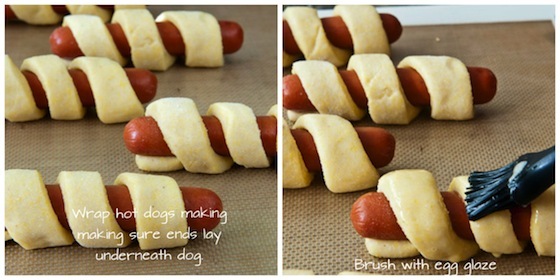 These Swirly Dogs are made with the same dough as my Pillsbury Cornbread Twists. 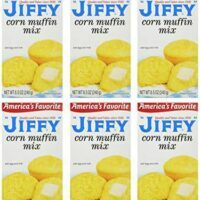 If you hang around here much, you may recognize that recipe as my attempt to clone Pillsbury’s now defunct canned cornbread. In the past, I wrapped hot dogs with the canned twists. Now I can make the dough myself. As always with my bread machine recipes, I almost never bake in my machine. I only use it to mix and knead the dough. When the dough cycle has completed and the dough is double the original size, pull the dough out of your machine. Follow the pictures below to shape the dough. 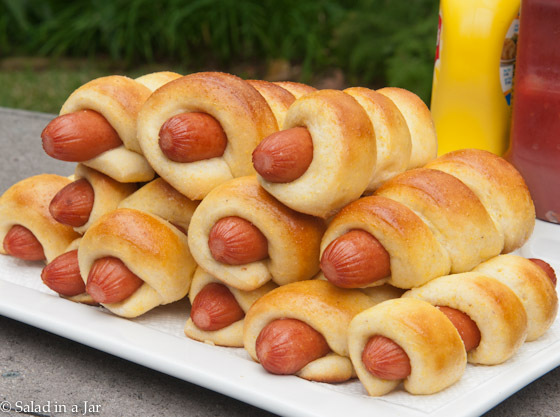 A hot dog wrapped with a yeasty cornbread dough made in a bread-machine or stand mixer and baked. Heat milk to lukewarm. Add to bread-machine pan along with remaining ingredients in order listed. Set on dough cycle. 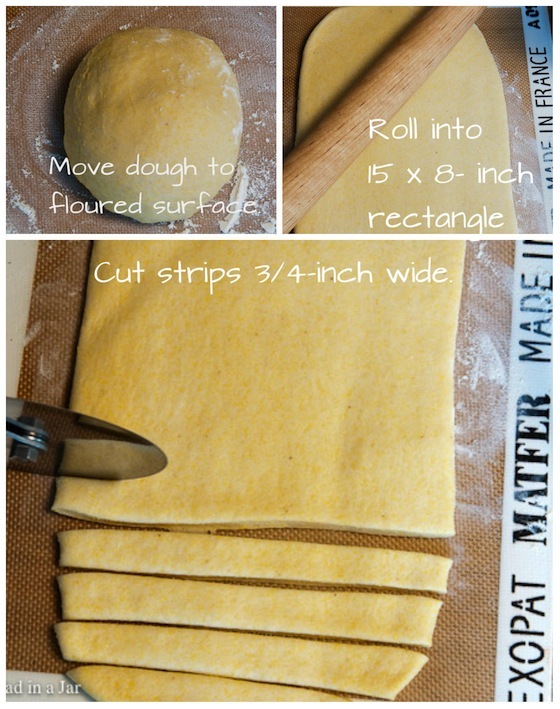 Check dough after 5-10 minutes to make sure it sticks to the sides, then pulls away. If very sticky, add flour 1 tablespoon at a time. If too dry and thumping against the side of the pan, add a teaspoon of milk or water until dough sticks, then pulls away. When dough cycle completes, remove dough to floured surface. Roll into 15 x 8-inch rectangle. Cut into 15 strips (about 3/4-1 inch wide) the short way. See picture above. 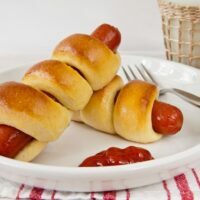 Roll one strip around each hot dog. Lay onto greased cookie sheet or silicone mat with ends tucked under. Cover swirly dogs and set in warm place to rise about 30 minutes. Combine egg and water for glaze. Lightly brush glaze on each do taking care not to use so much glaze that it drips on to the cookie sheet as it will burn. Bake 12 minutes until golden. To make in a stand mixer, add all ingredients in order given. Add an additional tablespoon of milk. Mix on low for 1 minute with paddle attachment. 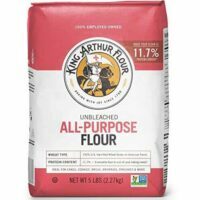 Change to hook attachment and knead at a low to medium speed for 7-10 minutes or until the texture is elastic and dough cleans the bowl. Cover dough and allow to raise in a warm place until double. Proceed as pictured above. Nutritionals on this recipe do not include the hot dog. Please, I have a question? No butter or oil in the Swirly Dog recipe? Do you have a recipe for Sqaw Bread? It is dark and sweet and I like very much. No recipe for Squaw Bread here. I’m not familiar with it. These look so good and so fun! I buy those lower calories hot dogs too. Sometimes they take a little extra work to bite through the outer casing but I shiver at the fat and calories in regular hot dogs. I can taste these with a nice mustard. They look so good. What are your instructions on thawing and reheating? My technique is similar to how I would reheat leftover frozen pizza. 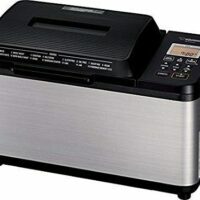 If I’m in a big hurry, I just zap it in the microwave–time will be different according to your microwave but it doesn’t take long for one–a minute maybe? If you want a crispy crust, put it in the oven for 10 minutes or so on 350 degrees. Or you could combine the two. Microwave to thaw out the hot dog and then into the oven to crisp it up–maybe 5 minutes. This hot dog lover thinks these look amazing! So great for kids too! Think I will have to keep some of these in our freezer.